FOXSEW Walking Foot Post Bed Zigzag Sewing Machine is widely used for stitching uneven shape, the pocket, accurate and other special shapes sewing, caps, bags, diving suit, sports shoes, footwear, boots, saddle, environment filter, rubber coated cloth, automobile upholstery, furniture, luggage, industrial safety products, hat, medical apparatus etc. There are two points, three points, four points for selection.thick and rigid materials, such as Nylon, Polyester, Polypropylene, Webbing, Kevlar, Vinyl, Leather and Canvas, the large Zigzag width of up-to 10mm and stitch length maximum up-to 5mm combining together to give nice decorative or functional stitching on a wide range of applications. The post bed design guarantees improved material handling on three-dimensional items, such as, balls, bags, gloves, shoes, straps, filters and other such items which cannot be sewn on a standard flat bed machine; Double-capacity hook improves the work efficiency, Automatic lubrication system improves the service life. 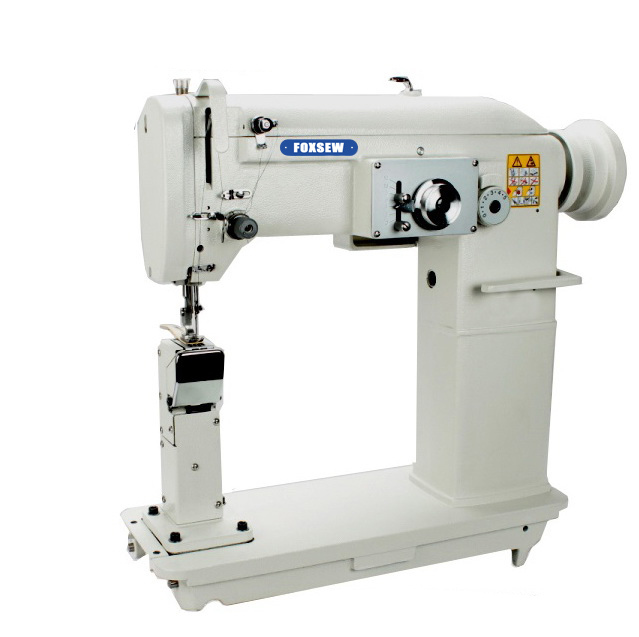 This post bed zigzag sewing machine is suitable for sewing various tubular products, especially sports and leather products, neoprene, bags, diving suits, hats, shoes, sofas, tents, gloves, etc... It`s with double presser foot top and bottom feed system makes the stitches neatly and beautifully. Adopts large hook, reduce bottom threads change times, greatly improving the sewing efficiency, optional 2-step and 3-step zigzag sewing can enhance the sewing firmness, automatic lubrication, low noise and vibration, easy operation, Post bed size: 60x70mm, Height of Post Bed: 180mm. It`s available equipped with Tape Binder. Looking for ideal Walking Foot Heavy Duty Post Bed ZigZag Machine Manufacturer & supplier ? We have a wide selection at great prices to help you get creative. All the Children Products Sewing Machine are quality guaranteed. We are China Origin Factory of Beer Holders Sewing Machine. If you have any question, please feel free to contact us.